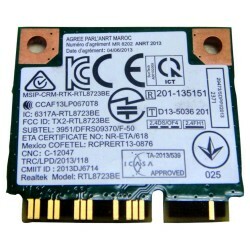 Realtek RTL8192EE Wireless Lan drivers version 2023.14.0615.2015 - Packet drivers for network adapters, WiFi 802.11b/g/n the company Realtek. Drivers support the operating systems Windows 10, Windows 7, Windows 8, Windows 8.1 at 32 or 64 bits. "D-Link DWA-582 Wireless AC1200 Dual Band PCI Express Adapter"
"Realtek 8822BE Wireless LAN 802.11ac PCI-E NIC"
"Realtek 8723DE Wireless LAN 802.11n PCI-E NIC"
"Realtek 8814AE Wireless LAN 802.11ac PCI-E NIC"
"Realtek Wireless LAN 802.11n PCI-E Network Adapter"